#spon: Today’s post is brought to you by Save A Lot who provided me with Gift Cards to create this post. Let's face it - the holidays are expensive. My husband and I do not have kids yet but still find ourselves spending entirely too much between the months of November and December. Between gifts, holiday parties, donating to charity and buying food, it seems our checking account gets abused during these months. I was given an opportunity to create a holiday meal at Save-A-Lot. On their website, Save-A-Lot shows you how you can feed a family of four a holiday meal for only $25. We had a huge Thanksgiving meal where each of the family members brought a dish, so I decided to turn this into a holiday brunch challenge! I took the $25 gift card Save-A-Lot sent me and headed out for supplies. Prior to this visit, I had never visted a Save-A-Lot. I was shocked to see the amount of name brand items they had in the store at very low prices. 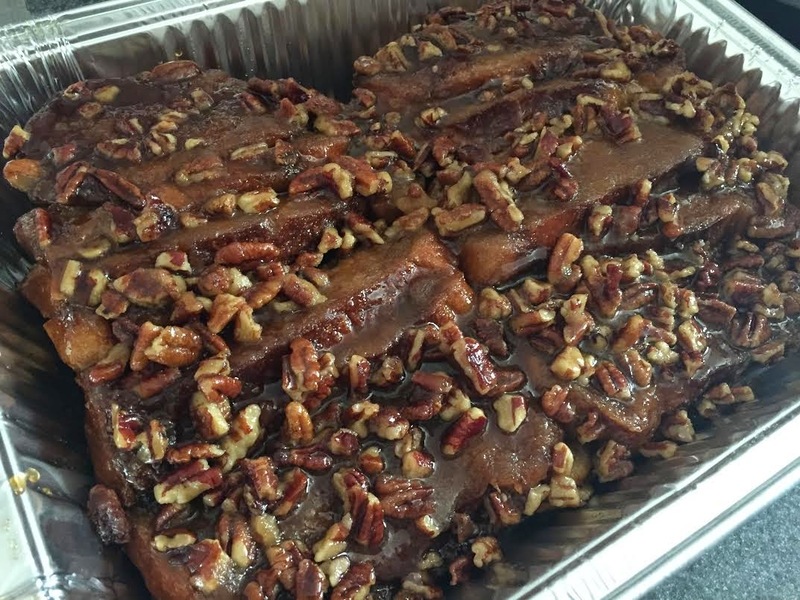 I was able to pick up everything I needed to make Praline-Pecan French Toast Casserole and a Sausage Breakfast Casserole, along with grabbing additional items for our Thanksgiving Day brunch, including bacon, fruit and orange juice! Not only did I meet the challenge, but I was able to extend it by feeding a family of 8 for under $25! While it may not be the prettiest casserole you've ever seen - it was the BEST I've ever tasted. My family was raving about it. You prepare it the night before, so all you have to do is preheat the oven in the morning, giving you more time to spend with the family. 1. Cut 10 (1-inch-thick) slices of bread. 2. Stir together brown sugar and next 2 ingredients; pour into a lightly greased 13- x 9-inch baking dish. Sprinkle with chopped pecans. 3. Whisk together eggs and next 4 ingredients. 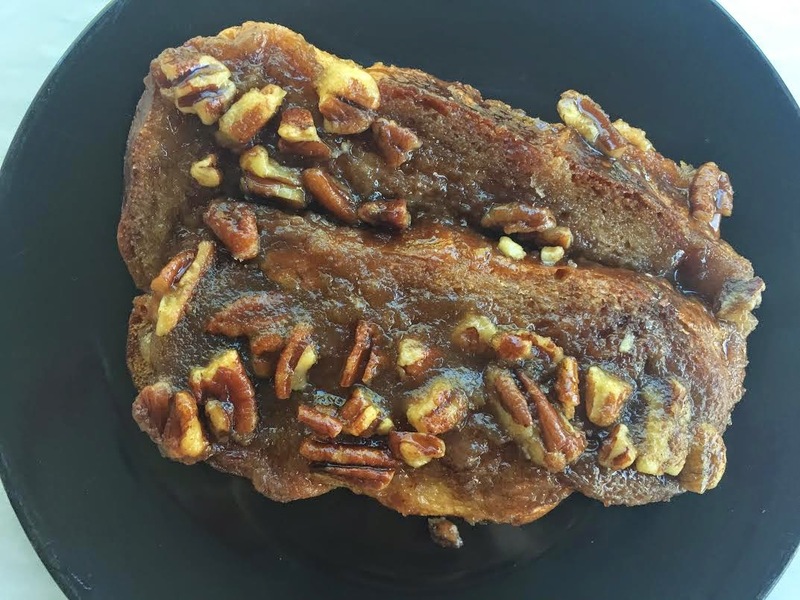 Arrange bread slices over pecans; pour egg mixture over bread. Cover and chill 8 hours. 4. Preheat oven to 350°. Bake bread 35 to 37 minutes or until golden brown. Serve immediately. After the 4th step, I used the lid on the disposable baking dish I got from Save-A-Lot and flipped the casserole so the praline would be face up. I suggest you ask someone to assist you with this step so you don't ruin your casserole! I also purchased the items to make my holiday morning staple - sausage and egg casserole, giving a savory option! You can use the leftover bread, eggs and milk from the first casserole. Sadly, I was taking pics of the French Toast Casserole while they tore into this one, so you will have to believe me when I say it is a delicious. 2. Spray a 13- by 9-inch baking dish with nonstick cooking spray. 3. In a large skillet, cook the sausage over medium heat, stirring frequently, until browned and crumbly, about 10 minutes; drain well on paper towels. 4. Cut and discard the crusts from the bread. Cut the slices in half, and arrange in a single layer in the prepared baking dish, cutting pieces to fit as necessary to cover the bottom of the dish. Sprinkle with the sausage and cheese. 5. In a large bowl, whisk together the eggs, milk, mustard, seasoned salt and pepper; carefully pour the mixture over the cheese. 6. Bake casserole until set and golden, about 40 minutes. Let stand for 10 minutes before serving.